With years of experience in a wide variety of installation projects, Harris & Co. has the know now and skill to deliver the results your desire. We have built a reputation for being versatile which has allowed us to work with clients on projects of all scopes and sizes. 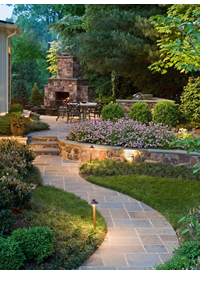 We provide homeowners with solutions to landscape issues and creative ideas to improve their outdoor space. With property values always a concern, Harris & Co. can offer ideas to help increase the value of your home. In addition to individual homeowners, we work with homeowners’ associations and colleges and parks for all of their landscaping needs including entrance design, maintenance and seasonal color. Harris & Co. brings dependability to the budget and schedule driven new construction market. From large scale multi-family and industrial projects to single family homes and every type of new construction in between, Harris & Co. has delivered the very best in quality. We help business owners design an outdoor environment that invites customers in and create an atmosphere of pride and professionalism for their employees. Well designed landscaping frames your entrance and makes a powerful statement about who you are and how you do business. An attractive, well designed landscape can substantially increase a property’s value, make it more desirable to potential tenants, or improve a company’s image.